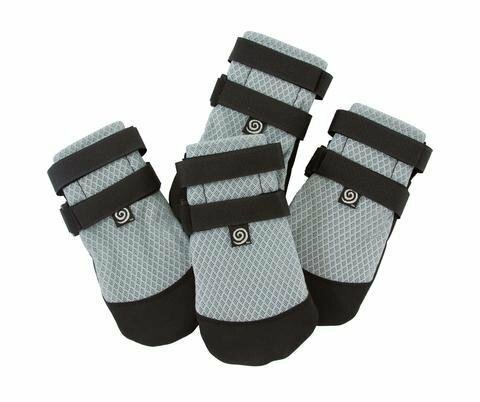 Ultra Paws Cool Dog Boots deflect the surface temperature away from your dog's paw. Designed for protection from hot surfaces - sidewalks, concrete, streets, boats, docks and sand. $35.95 to $39.95 for four boots, depending on size. U.S. Patent 7,971,557. Canadian Patent 2,486,628. Other patents pending. Breathable mesh upper on all size boots and soles have reflective foil and foam to reflect the heat away. Small - XLarge have an environmentall friendly recycled rubber sole. Generous foam at the closures create a secure grip and cushion the dog's paw when the boot is tightened. To extend the life of your dog boots we recommend applying Shoe Goo to patch small holes in the sole that can appear with wear. Available on our web site.